What does the inside of your fridge look like? If I could peek inside, what would it tell me about you? My fridge is always packed to the gills. Grains, flours, beer at the back. Root vegetables, sometimes of indeterminate age, in the bottom. Cheeses in a drawer. Condiments piled (piled, I say!) into the top shelf and door. Milk and yogurt up front. And everywhere else: more vegetables, so many vegetables, and leftovers. It’s a reflection of who I am in many ways: it says that I like food. That I’m a packrat, maybe, but also an optimist, thinking I’ll cook dinner six nights a week and always snack on vegetable spears instead of the kids’ cheese and crackers. It is not the fridge of a meal-planner; instead, our meals are often dictated by what’s in the fridge rather than the other way around. In the meanwhile, it’s an opportunity to let a few great ingredients shine. I usually scramble my eggs by letting the bottom layer set then rumpling it up along the bottom of the pan so the uncooked egg runs off and also sets, then I turn the eggs over briefly. How do you do yours? I never gave any thought to scrambling eggs until I tried this “poached scrambled eggs” method, and then I read Julia Child saying not to touch them for the first three minutes, and now I’m wondering what other techniques are out there that never would have occurred to me. This is an important question in my life because, as you know, I rely heavily on scrambled eggs. Sweet Corn Scramble: Melt a knob of butter in a medium frying pan. For each serving, scrape the kernels from an ear of corn (save that cob for stock!) and saute in butter along with a few sliced green onions and a pinch of salt until onions are bright green. Whisk a couple of good eggs with another pinch of salt and a splash of water, pour the eggs over the corn mixture, and scramble until cooked to your liking. Serve alongside the simplest tomato salad of all time: a diced tomato and a few chunks of avocado topped with a sprinkle of salt. 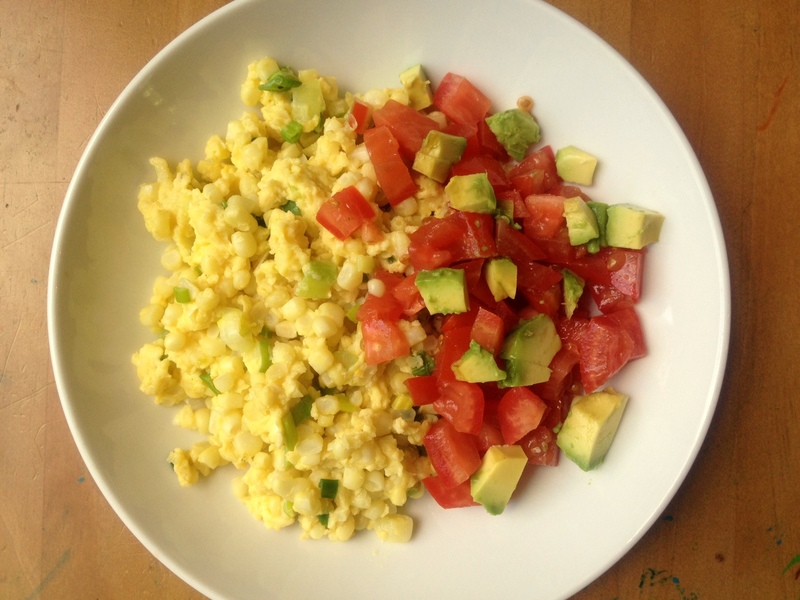 This entry was posted in Breakfast, Eggs, Food, Recipes and tagged refrigerators as personality tests, scrambled eggs, summer recipe, sweet corn, tomato salad on July 4, 2012 by emmycooks. my fridge … sigh. I think it probably reflects my OCD more than anything. I get panicky when I can’t see the back. I usually wipe bottles off before I put them back in. I like cartons and things to be lined up at right angles, and I don’t like things to touch. Wow, as I type it, I see why my husband finds it so nutty and annoying. I have drawers for cheese, eggs, butter, meat, one for leaf veggies and one for onions and roots. I have a double-layer shelf for fruit (like, two layers of glass – I read this somewhere, no idea where, and no idea if it actually makes a difference in keeping things fresh?). All that said …. I am not a total planner either. I “plan” at the market – in the sense of, hey, that fish looks really good, and I think we have some fennel bulbs, and wasn’t there a hunk of gruyere that I saw in the drawer … and might those be a meal? Sounds so good, especially with the tomato& avocado salad. Sadly, my fridge would tell you I’m the type of person who tends to forget about leftovers! We recently tried Gordon Ramsey’s method, which involves constant stirring with a silicon spatula, and results in very creamy, small-curd scrambled eggs. Sometimes we feel decadent, so we do the recipe from Bill’s restaurant in Sydney, which has 1/2 cup of cream with two eggs. Mostly we follow the Cook’s Illustrated method, which uses high heat and results in big, pillowy curds. As you might guess, eggs appear on our dinner plates frequently. Our ‘fridge is usually overflowing, much like yours! I’d never thought of corn in scrambled eggs, but it sounds really good. Great minds again, I just did a scramble post myself! I like to cook my scrambled eggs on low heat, stirring constantly, so that you get very even kernels…I’ve got some extra corn from 4th of July too, so might be throwing that into the next batch! Craft beer, Campari, Gin, Red Vermouth, butter, eggs, tortillas, and hot sauce. I generally just throw eggs on hot butter and stir with a little dried basil, but we always threaten to cook them the Nero Wolfe way. If you aren’t familiar with Nero Wolfe, he’s an excentric detective written by Rex Stout and food was always on his mind. In his employ was a world class chef named Fritz and the two held some rigid and divergent opinions. I’ve read most of the books, but this one I saw on A&E. Wolfe was hiding a woman in his house from some nefarious group or another. He told her that breakfast was served at x time in the morning and asked her if she had ever had scrambled eggs. She said she had, but he countered “I doubt it.” and said that proper scrambled eggs take forty five minutes to do properly. I’ve read a few recipes that agree. You need a lot of eggs, cream, a steam pan, patience, and no tennis elbow but it is supposed to be amazing. It should be tried at least once in a lifetime. I haven’t yet, but I will.